BACKGROUND AND PURPOSE: The accuracy of DSC-MR imaging CBV maps in glioblastoma depends on acquisition and analysis protocols. Multisite protocol heterogeneity has challenged standardization initiatives due to the difficulties of in vivo validation. This study sought to compare the accuracy of routinely used protocols using a digital reference object. MATERIALS AND METHODS: The digital reference object consisted of approximately 10,000 simulated voxels recapitulating typical signal heterogeneity encountered in vivo. The influence of acquisition and postprocessing methods on CBV reliability was evaluated across 6912 parameter combinations, including contrast agent dosing schemes, pulse sequence parameters, field strengths, and postprocessing methods. Accuracy and precision were assessed using the concordance correlation coefficient and coefficient of variation. RESULTS: Across all parameter space, the optimal protocol included full-dose contrast agent preload and bolus, intermediate (60°) flip angle, 30-ms TE, and postprocessing with a leakage-correction algorithm (concordance correlation coefficient = 0.97, coefficient of variation = 6.6%). Protocols with no preload or fractional dose preload and bolus using these acquisition parameters were generally less robust. However, a protocol with no preload, full-dose bolus, and low (30°) flip angle performed very well (concordance correlation coefficient = 0.93, coefficient of variation = 8.7% at 1.5T and concordance correlation coefficient = 0.92, coefficient of variation = 8.2% at 3T). CONCLUSIONS: Schemes with full-dose preload and bolus maximize CBV accuracy and reduce variability, which could enable smaller sample sizes and more reliable detection of CBV changes in clinical trials. When a lower total contrast agent dose is desired, use of a low flip angle, no preload, and full-dose bolus protocol may provide an attractive alternative. The National Cancer Institute (Quantitative Imaging Network; https://imaging.cancer.gov/programs_resources/specialized_initiatives/qin.htm), the Radiological Society of North America (Quantitative Imaging Biomarkers Alliance; https://www.rsna.org/QIBA/), and the National Brain Tumor Society (Jumpstarting Brain Tumor Drug Development Coalition Imaging Standardization Steering Committee; https://www.itnonline.com/content/new-standardized-brain-tumor-mri-recommendations-announced) havetried to standardize DCE-MR imaging methodology. The American Society of Functional Neuroradiology (ASFNR) published a white paper with a recommended DSC-MR imaging protocol based on practice patterns and literature data.23 Such effort is challenged by the relative paucity of data from systematic evaluations of the influence of DSC-MR imaging methodology on CBV accuracy and has relied on anecdotal evidence, including the correlation of CBV with glioma grade,24 fractional tumor burden in cases of postradiation enhancement,16 and patient survival in the setting of conventional and antiangiogenic therapies.12 Stereotactic biopsies with coregistered CBV maps have demonstrated general concordance between CBV estimates and histology. While prior in vivo studies evaluated the impact of DSC-MR imaging acquisition parameters and methodologies on CBV data in a small number of patients with high-grade gliomas,25 their influence on the underlying CBV accuracy has not been evaluated, likely due to the impracticality of multiple bolus injections in individual patients. To facilitate the rigorous evaluation of the impact of DSC-MR imaging parameters on CBV accuracy, we recently developed and validated a population-based digital reference object (DRO) that recapitulates for glioblastoma the biophysical basis and inter- and intrasubject heterogeneity of DSC-MR imaging data.26 The DRO consists of DSC-MR imaging signals computed across a range of relevant physiologic and acquisition parameters, and clinical relevance was ensured through use of training and validation datasets acquired from multiple patients with glioblastomas. Accordingly, the DRO provides a reliable ground truth for determining the impact of DSC-MR imaging acquisition and postprocessing methods on CBV accuracy. In this study, we used the DRO to evaluate the accuracy and precision of routinely used DSC-MR imaging protocols for glioblastoma, in which the choice of acquisition parameters, including preload and bolus dose, flip angle (FA), TE, and TR, can greatly impact the sensitivity of the acquired signals on T1 and T2* contrast agent leakage effects. Additionally, the accuracy of postprocessing leakage-correction methods24,27 may also depend on the degree of T1 and T2* contrast agent leakage effects, further affecting CBV accuracy. Given the interrelated nature of acquisition and postprocessing methods, we used the DRO to evaluate CBV accuracy across a range of commonly used DSC-MR imaging methods, identifying combinations of acquisition parameters yielding particularly high CBV accuracy and precision and potentially guiding future DSC-MR imaging consensus initiatives. We evaluated CBV fidelity across a range of relevant DSC-MR imaging parameters using a validated DRO that computes MR imaging signal intensities for heterogeneous 3D tissue structures, accounting for the relevant underlying DSC-MR imaging contrast mechanisms.26 Parameter inputs were extracted from voxelwise training data from 23 patients with glioblastomas (>40,000 voxels). To ensure that the simulated signals accurately represented the magnitude and distribution of contrast agent–induced T1 and T2* changes within typical glioblastomas, we chose model parameters so that the distribution of percentage signal recovery and the mean SD of signal intensities across the DRO matched those in the patient training dataset. The training process yielded approximately 10,000 DRO voxels that agreed with the in vivo data. The DRO was validated against a separate set of patients with glioblastomas imaged with pulse sequences and contrast agent dosing schemes differing from those in the training dataset. 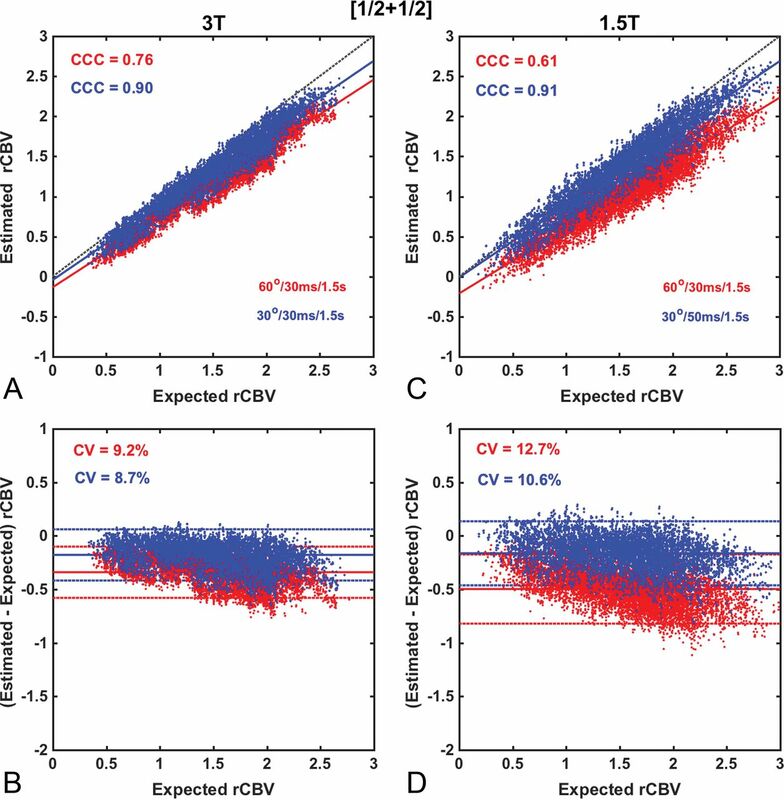 To investigate the influence of acquisition and postprocessing methods on the reliability of CBV measurements, we compared tumor CBV simulated with and without contrast agent leakage effects for the most commonly used DSC-MR imaging methods, including the following: 6 preload and bolus injection combinations, 3 flip angles, 3 TRs, 2 B0 values, 4 TEs, and 4 upper time limits for postprocessing integration (with a constant prebolus time). Furthermore, we compared the uncorrected CBV estimates with 4 postprocessing leakage-correction methods: Boxerman-Schmainda-Weisskoff (BSW),24 bidirectional,27 γ-variate fit, and postbolus baseline subtraction.25 Note that while baseline subtraction correction is typically applied to low flip angle data that predominantly exhibit T2* leakage effects, we implemented a version that corrects both T1 and T2* effects. Because baseline subtraction correction arbitrarily forces all signals to return to baseline, it was applied to both normal and tumor signals in the DRO. The investigated parameter space is summarized in Table 1. 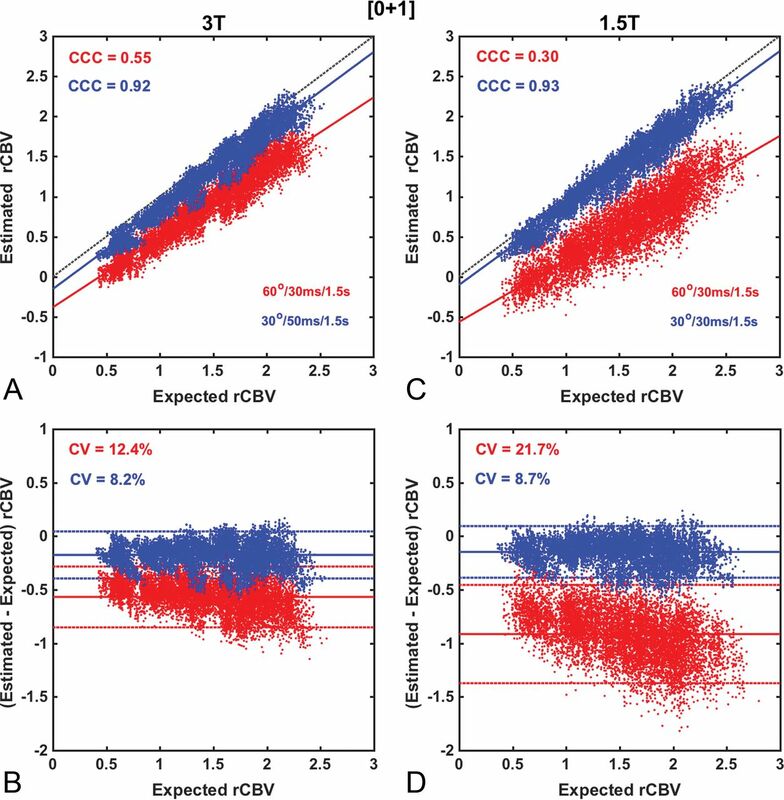 Across all parameter space, the concordance correlation coefficient (CCC) and the coefficient of variation (CV) between the simulated tumor CBV and the ground truth (the CBV values not confounded by leakage effects) were computed as a marker of accuracy and precision, respectively. To aid in the identification of the optimal protocol, we computed an accuracy and precision index (API) that combines the CCC and CV: AP = CCC − |CV|/100. Accordingly, API values of 1 (CCC = 1, CV/100 = 0) reflect the ideal agreement. Protocols compliant with a recently published consensus brain tumor imaging protocol (BTIP)28were highlighted because these can be most easily incorporated into clinical trial imaging protocols. Note that dosing schemes that are labeled “BTIP compliant” are those that align with the recommended dosing requirements and not necessarily the timing between the contrast agent injection and the postcontrast T1-weighted scan. Figure 1 shows the API heat map across the parameter space in Table 1. The heat map in Fig 1 is segmented horizontally by B0 (top half: B0 = 1.5T; bottom half: B0 = 3T). Within each B0 segment, the heat map is further segmented vertically by the acquisition time limit (4 segments) and horizontally by TR (3 segments). 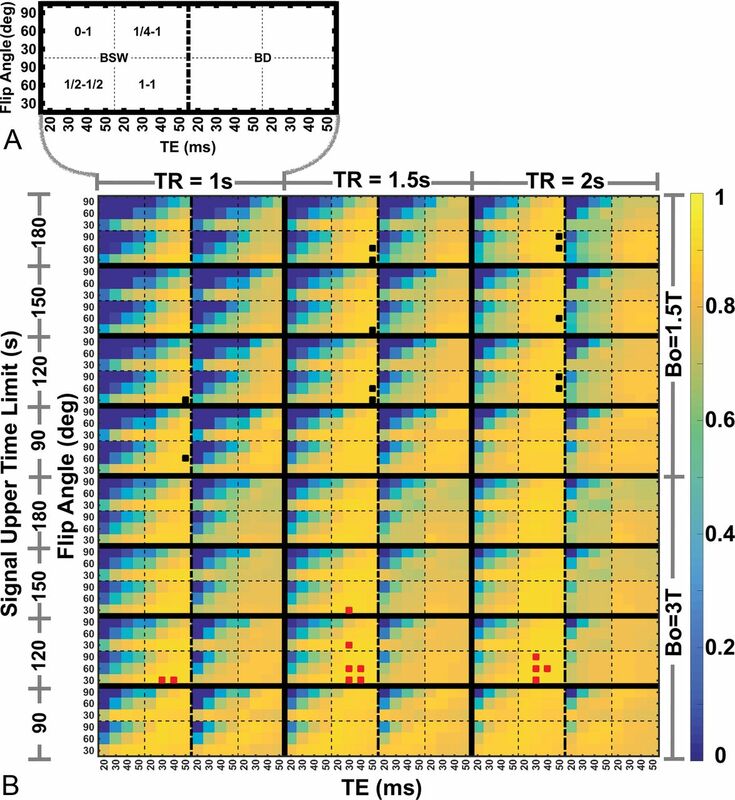 For each acquisition time limit and TR combination, the heat map is further segmented, as shown in Fig 1A, horizontally by the leakage-correction method (2 segments for BSW and bidirectional; γ-variate fit, baseline subtraction, and uncorrected are excluded). Finally, each leakage-correction segment is split into 4 subplots (2 × 2) by contrast agent dosing [clockwise from top left: (0 + 1), (¼ +1), (1 + 1), (½ +½)], where the first and second numeric values [eg, (1 + 1)] represent the preload and bolus-injection dose as a fraction of a total standard dose (0.1 mmol/kg). Each of these subplots shows the variation horizontally by TE (4 squares) and vertically by flip angle (3 squares). This singular figure demonstrates the API for 2304 possible parameter combinations (of the 8640 tested). 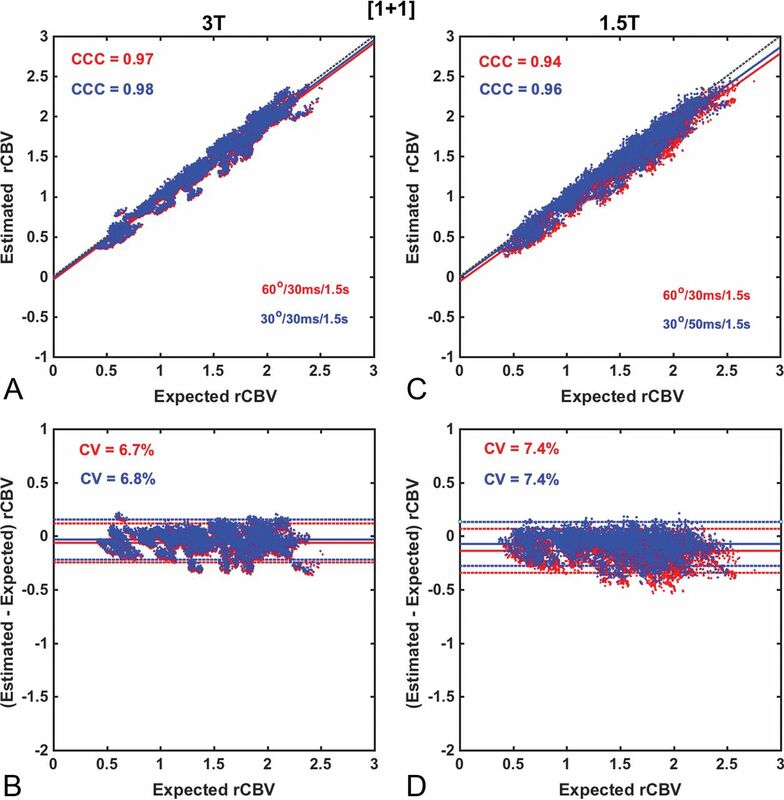 The uncorrected γ-variate fit and baseline subtraction results are not included in Fig 1B (or in subsequent figures or tables) because their associated CCC, CV, and API values were substantially lower than those for BSW and bidirectional. For simplicity, the (¼ + ¾) and (½ +1) contrast agent dosing schemes were not incorporated in the heat map, but their results are summarized in Table 2. Several results can be observed from the heat map. First, at both field strengths, (1 + 1) contrast agent dosing provides the highest API and the least sensitivity (more consistent API values) to variations in TR, TE, and flip angle, compared with other dosing schemes. Across all parameter combinations, the top 1% of API values (>0.89) are derived from protocols that rely on (1 + 1) contrast agent dosing at both field strengths, as indicated by the black (1.5T) and red (3T) boxes. Although the top 1% of parameter combinations incorporate BSW leakage correction, both BSW and bidirectional leakage correction methods yielded similar APIs. Note that the top 1% is an arbitrary threshold, and the difference in utility of CBV maps derived from methods yielding slightly lower APIs (eg, top 1% versus the top 3%–5%) may not be clinically meaningful. Second, the API varies more substantially for acquisitions using (0 + 1) and (½ + ½) contrast agent dosing schemes, indicating greater sensitivity to contrast agent leakage effects and CNR losses related to low contrast agent dose. Third, for data acquired without or with small contrast agent preloads, a low flip angle (30°) maximizes the API. Fourth, the number of data points incorporated after the first pass into the CBV acquisition and analysis has minimal impact on API values, with a slight preference for shorter data lengths using the BSW correction. Figures 2⇓⇓–5 compare the accuracy and precision of CBV measures using scatterplots (top) and Bland-Altman plots (bottom) for commonly used contrast agent dosing protocols [Fig 2: (1 + 1), Fig 3: (½ +½), Fig 4: (¼ + 1), Fig 5: (0 + 1)], field strengths (1.5T and 3T), and flip angles (low 30° versus intermediate 60°). The BSW leakage-correction method was applied to all data. For each flip angle, the TE was selected to maximize the API, yielding 4 parameter combinations: 1.5T, FA/TE = 30°/50 ms and FA/TE = 60°/30 ms; 3T, FA/TE = 30°/30 ms and FA/TE = 60°/30 ms. The first goal of this analysis was to evaluate CBV accuracy when data are acquired using the ASFNR parameter recommendations (represented by the intermediate flip angle protocol) and variable dosing protocols and field strengths. The second was to compare this performance with that derived from the low flip angle case, which provided the overall highest CBV accuracy and precision. Across the entire range of parameters, the highest CBV accuracy and precision (API = 0.91) was found for DSC-MR imaging data collected at 3T with a (1 + 1) dosing scheme and either an intermediate or low flip angle (Fig 2). At 1.5T, the CCC and CV values were only slightly lower than those at 3T, yielding similar API values (0.86 and 0.89 for intermediate and low flip angles, respectively). For the (½ + ½) dosing scheme, illustrated in Fig 3, CBV measured using the intermediate flip angle protocol was consistently underestimated due to residual (uncorrected) T1 leakage effects, yielding moderately lower accuracy and precision (API = 0.67) at 3T and poor performance (API = 0.48) at 1.5T. The use of a low flip angle improved the API at both 3T (API = 0.82) and 1.5T (API = 0.80) due to reduced T1 sensitivity. However, the API for this dosing scheme was consistently lower than the (1 + 1) dosing scheme. As illustrated in Fig 4, the use of an intermediate flip angle at 3T without a preload (0 + 1) dosing scheme substantially reduced both accuracy and precision (API = 0.43). This poor performance was exacerbated at 1.5T (API = 0.08). These results are consistent with previous studies demonstrating the necessity of preload when using moderate and high flip angles.25,29,30 By comparison, the use of the low flip angle protocol at 3T without preload introduces a relatively minor penalty (API = 0.83) compared with the (1 + 1) dosing scheme (API = 0.91). At 1.5T, CBV measured using the low flip angle protocol provided a substantial improvement compared with the intermediate flip angle in both accuracy and precision (API = 0.84). Figure 5 shows CBV accuracy and precision for DSC-MR imaging acquired with (¼ + 1) contrast agent dosing. At 3T, both the intermediate and low flip angle protocols provide excellent accuracy (API values of 0.86 and 0.90, respectively), comparable with that for the (1 + 1) dosing scheme at 3T (API = 0.91). At 1.5T, the intermediate flip angle protocol yielded intermediate accuracy and precision (API = 0.78), whereas the low flip angle protocol yielded an API value (0.89) comparable with that for the (1 + 1) dosing scheme at 3T. Table 2 compares CCC, CV, and API for the intermediate and low flip angle protocols at both field strengths and all dosing schemes. Across all dosing schemes and field strengths, the low FA provided equivalent or better API values compared with CBV data acquired with an intermediate FA. For BTIP-compliant dosing schemes (0 + 1), (¼ +¾), (½ +½), and (1 + 1), the (1 + 1) dosing yielded the highest accuracy and precision for both intermediate and low FA acquisitions and at both field strengths. With an intermediate FA, single total-dose protocols (0 + 1), (¼ + ¾), and (½ +½) at 1.5T and the no preload protocol (0 + 1) at 3T have poor performance, with moderately good performance for split-dose protocols (¼ + ¾) and (½ + ½) at 3T. For non-BTIP-compliant dosing schemes (¼ +1) and (½ +1), low and intermediate FA acquisitions yielded excellent results at 3T, and very good results at 1.5T, comparable with the optimal (1 + 1) dosing protocol. 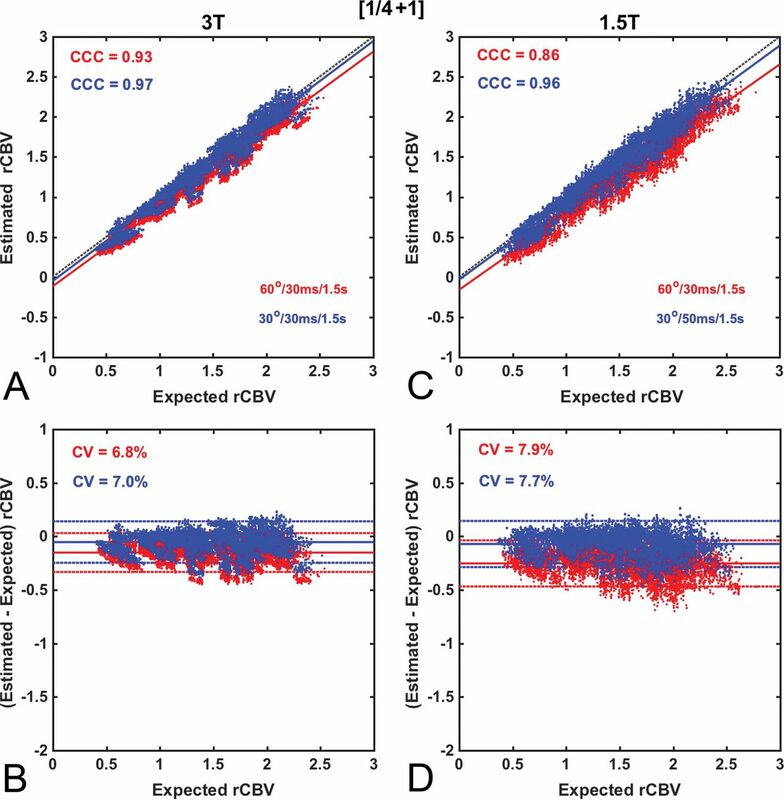 The computational analysis presented herein confirms that it is possible to acquire highly accurate and precise relative CBV (rCBV) measurements in glioblastoma with proper selection of DSC-MR imaging methodology. To date, recommendations on optimal DSC-MR imaging acquisition protocols, such as the ASFNR white paper,23 have relied on susceptibility contrast theory, clinical experience, and limited studies involving correlation with stereotactic biopsies,16,31 but this study establishes the limits of accuracy and precision using a computational approach across a wide range of parameters and, accordingly, may be used to inform the aforementioned standardization initiatives. While the DRO used in this study can quantitatively assess rCBV accuracy for any combination of acquisition and postprocessing parameters, the overwhelming number of permutations makes identifying a single optimal approach challenging. For example, the heat maps illustrate that there are many unique parameter combinations that yield reasonably accurate rCBV estimates. However, for many of these combinations, minor parameter modification (eg, changing flip angles or TEs) yields substantially decreased accuracy and/or precision. Such isolated “local maximums” reflect specific parameter subsets that may suffice for singular distributions of T1 and T2* leakage effects but that are not broadly effective when those distributions are altered, such as greater sensitivity to T1 effects due to higher flip angles. While the DRO captures the full range of T1 and T2* leakage effects that would be encountered across patients, the distribution of these effects within a single patient could be unique. Accordingly, our strategy for identifying the most robust DSC-MR imaging protocol included accuracy, precision, and consistency across localized parameter space (eg, a consistent API as the TE is varied), ensuring the identification of optimal methods both across and within patients. Across all parameter space, the combination of preload scheme and acquisition parameters yielding the most robust rCBV estimates included full-dose preload and bolus (1 + 1), with either the recommended ASFNR (intermediate flip angle) or low flip angle pulse sequence parameters. This finding is consistent with a prior in vivo study that demonstrated that the (1 + 1) dosing scheme provided the most robust distinction between tumor and normal tissue rCBV.25 Most important, this dosing scheme maintains BTIP compliance because the postcontrast T1-weighted images can be acquired between preload and bolus contrast agent injections. The (1 + 1) dosing scheme requires double the standard dose of contrast agent (0.2 mmol/kg), and given the growing concern for long-term gadolinium deposition within the brain following repeat use of gadolinium-based contrast agents, we also investigated the accuracy of lower-dose schemes. Lower-dose, BTIP-compliant dosing schemes using the intermediate flip angle protocol introduced bias and lower precision compared with the (1 + 1) scheme. Lower preload doses yielded more error because they are not as effective at reducing T1 leakage effects before the primary bolus injection. Another major finding of this work is that DSC-MR imaging data acquired with a low flip angle provide comparable or improved CBV accuracy across all dosing schemes and field strengths. As highlighted in Table 2, the acquisition protocol using a single total-dose contrast agent administration, [(0 + 1), (¼ + ¾), (½ + ½)], which yielded only a slighted reduced API, was a low flip angle scheme (FA = 30°, TR = 1.5 sec; TE = 50 ms at 1.5T and TE = 30 ms at 3T). The corresponding CCC values exceeded 0.9 at both 1.5T and 3T but exhibited slightly higher CV values due to a lower contrast-to-noise ratio compared with the (1 + 1) double-dose protocol. The similarity of the API values across these single total-dose protocols, when combined with a low flip angle, indicates that the preload does not improve CBV fidelity and may not be needed in clinical practice. The use of a (0 + 1) dosing scheme with a low FA has the benefit of maintaining BTIP compliance and requiring only a single bolus injection, thereby simplifying perfusion scan protocols and increasing their consistency across patients and clinical trial sites. Given the potential ramifications of this finding on DSC-MR imaging recommendations, it would be highly relevant to compare, in the same patients, the agreement and CBV map quality from data acquired with this low flip angle alternative and the ASFNR recommendations (using the double-dose protocol). Given that DSC-MR imaging data acquired with TE = 50 ms (the optimal TE at 1.5T) could be more sensitive to EPI-related artifacts and exhibit lowered contrast to noise, in vivo studies should be performed to confirm CBV map quality and interpretability. Paulson and Schmainda25 found that the use of a low flip angle and a 50-ms TE reduced the difference between tumor and normal tissue rCBV. By leveraging a validated DRO, we characterized the influence of DSC-MR imaging methodology on CBV accuracy and precision and identified optimal protocols for clinical use. Our results support, to a large extent, the ASFNR recommendations on DSC-MR imaging best practices,23 particularly at 3T and when paired with the (1 + 1) dosing protocol, which should encourage its broader acceptance and standardization. Taken together, the results indicate that for clinical trials, a (1 + 1) dosing scheme provides highly accurate and consistent CBV estimates, enabling smaller sample sizes for detecting treatment-related changes in CBV. For clinical surveillance scans, in which a lower total gadolinium dose is desirable, the low flip angle option without preload or the (¼ +1) dosing scheme is a viable alternative, providing reasonably robust CBV measures. An added advantage of these schemes is that they perform well at both 1.5T and 3T. Such considerations may inform standardization initiatives for the acquisition and analysis of DSC-MR imaging data in clinical trials and routine patient care. Disclosures: Natenael B. Semmineh—RELATED: Grant: National Institutes of Health, Arizona Biomedical Research Commission, and Barrow Neurological Foundation, Comments: This work was supported by National Institutes of Health/National Cancer Institute (R01 CA213158), the Arizona Biomedical Research Commission (ADHS16–162414), and the Barrow Neurological Foundation. * Christopher C. Quarles—RELATED: Grant: National Institutes of Health. * Leland S. Hu—RELATED: Grant: National Institutes of Health/National Cancer Institute. * *Money paid to the institution. Accepted after revision June 8, 2018.